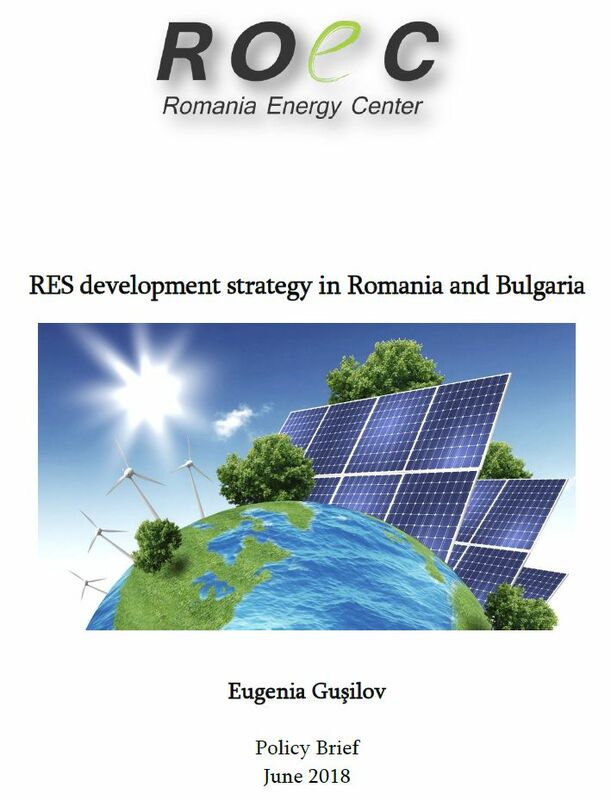 Already in 2014, overall Renewable Energy Sources (RES) use was 26% in Romania and 18% in Bulgaria, more than their respective targets for 2020 (24% – Romania, 16% – Bulgaria). According to the 3rd RES Progress Reports, in Romania RES have the biggest use in electricity production (44% in 2014), followed by heating & cooling (28%) and the lowest use in transportation (4.5%). In Bulgaria, RES have the largest share in H&C (28%), followed by power generation (18.9%) and transportation (5.3%). Both countries have achieved their 2020 targets of RES in final energy consumption ahead of time. During the period 2013–2014, nor Romania nor Bulgaria used cooperation mechanisms such as statistical transfers, joint projects and joint support schemes (no statistical RES transfers to or from other EU Members States). Romania’s first law to promote renewable energy was adopted in 2005 and produced no major results. 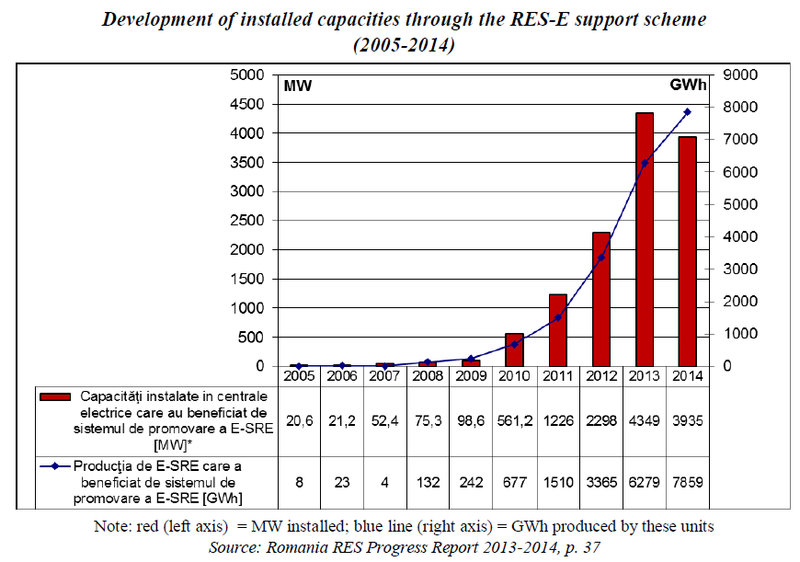 Only in 2008, with the adoption of the Law 220/2008 which provided serious incentives, did renewable energy really take off in Romania. The law set the national targets for electricity produced from RES in final gross electricity consumption at: 33% by 2010, 35% by 2015 and 38% by 2020. Law 220/2008 was based on mandatory annual quotas and put in place a support scheme based on green certificates (GCs) which was described at the time as one of the most generous in Europe. In 2009, Romania notified the support scheme to the European Commission which approved it in July 2011 (see Decision C(2011) 4938 on state aid SA 33134 (2011/N)). Romania becomes one of the fastest growing market for wind energy in the region and almost EUR 8 Billion is invested in RES projects as a result. From only a few MW of wind capacity (in 2007) it skyrockets to 2,000 MW (2013). At the end of 2017, total wind installed capacity in Romania was 3,029 MW. The entire RES capacity reaches a record 4,349 MW in 2013 (the peak year for new RES installed capacity). 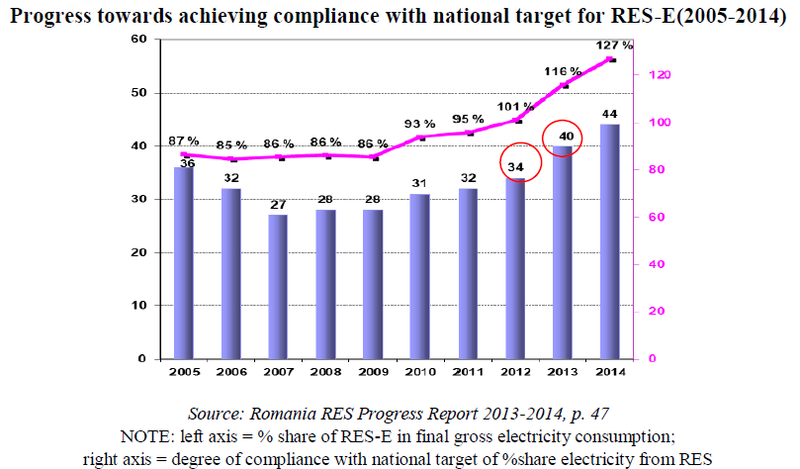 Despite exceeding the intermediary targets set under the national Renewable Energy Action Plan (NREAP) for renewable energy use in electricity production (RES-E) and for heating and cooling (RES – H&C), Romania struggles to meets its targets for renewable use in transportation: only 4.5% compared to the 7.72% target for 2014. However, in mid-2013 the law was ammended citing price affordability concerns. Government Emergency Ordinance (GEO) no. 57/2013 significantly curbed investor’s interest in renewable projects. A number of GCs per each technology were delayed from trading until March 2017: 1 GC for new hydropower plants (HPPs of up to 10 MW), 1 GC for wind farms, and 2 GCs for solar farms. These delayed GCs are to be awarded for new HPPs and solar farms starting with April 2017, for wind farms – as of January 2018 gradually until December 31, 2020. As a result, investment in wind projects dropped significanlty in 2013-2017. In fact, all wind projects that have been finalized since 2013 are projects that started in 2012, with only a few new capacities brought online – a sharp decline compared to the 2010-2013 period. For instance, new installed wind capacity in 2017 was just 5 MW, a significant drop even compared to the 48 MW of new installed capacity in 2016. As of 2017, the GC scheme is no longer applicable in Romania for newly installed capacities. The 2013 changes in RES regulation and the design of the support scheme (which mandates that the regulator sets annual quotas for RES that benefit from the GC support scheme) has created a glut on the GC market. Government Emergency Ordinance (GEO) #24 issued on March 31, 2017 created an anonymous market for trading GCs which was launched on September 1, 2017. The idea was to force everyone to trade Green Certificates (GCs) only on this centralized anonymous market organized by OPCOM. The purpose was to create competitive, transparent, public, and non-discriminatory trading. Over the summer of 2017, ANRE and OPCOM have worked on the regulatory framework for this anonymous market for GCs. Thus, starting with September 1, 2017, there are two separate anonymous markets for Green Certificates: the GC market for spot transactions and the GC market for term transactions. On the other hand, Romania presents a unique case in Europe in the case of the residential prosumer. Due to a regulatory oversight, in practice, only the big RES-E producers feed electricity in the grid. The small RES-producers (e.g. : an individual who has a PV installation on his roof) cannot feed his excess electricity into the grid and be paid for it. Since the adoption of the 2008 renewable energy law, the small renewable energy producers (<100 kW) were unable to sell the excess electricity into the grid because the Finance Ministry has not identified how to tax them. For 10 years, Romanian prosumers kept paying their electricity bills and feed excess electricity into the distribution grid for free. Currently (June 2018), the parliament is debating new amendments to the renewables legal framework targeting 3 things: 1) the exemption from the requirement of the residential prosumer to obtain an authorization from ANRE; 2) taxation (it is yet unclear if and how much will the prosumer be taxed); and 3) the VAT regime of the prosumer (whether he has to issue an invoice and how this is to be done in practice). The GCs suspended from trading until 2017, once released starting with April 2017, have created an oversupply on the market. According to PATRES, an association of renewable energy producers, there are some 11 million excess GCs on the market. According to ANRE VP Zoltan Nagy-Bege, “not all producers manage to sell their green certificates and revenues from green certificates are not evenly distributed among the 800 producers”. In April 2018 ANRE has announced that it plans to draft a new renewable support scheme for the period starting with 2021, and that it will most likely be a feed-in premium system. This is the first signal of Romania’s intention to continue support for RES after the end of the current support scheme. If adopted, it could make new RES deployment become again attractive for investors. 15 years for electricity produced by hydropower plants. An estimated EUR 4 billion were invested from 2009 to 2012. However, this coincided with the high costs of wind and solar equipment, which drove up the final price to consumers. In February 2013, people took to the streets to protest the high energy bills. Against these developments, the government introduced a couple of retroactive measures: a moratorium on new installations (August 2012), stopped the guaranteed prices for new RES projects (July 2013), and attempted to impose a 20% revenue tax on wind and solar producers (a measure subsequently declared as unconstitutional). In both Bulgaria and Romania (two of the countries most affected by energy poverty in Europe and with a large share of firewood use in residential heating), the RES support scheme was considered unsustainable in its initially designed form, and subsequently adjusted to ease the impact on the final consumer. In both countries, the RES support scheme produced the desired effect (a green investment boom), but the ultra-fast RES deployment triggered justified sustainability and affordability concerns. Finally, countries which have changed the renewable legislation (Bulgaria and Romania included) have often been sued lately at the International Centre for Settlement of Investment Disputes in Washington (the “ICSID Centre”) for compensation. As recently as June 12, 2018, for instance, 12 solar producers filed a claim at the ICSID against Romania on this very topic. This experience is likely to make South East European governments more cautious with new renewables support schemes in the future.